School of Biological Sciences, University of Adelaide, Adelaide, South Australia. DE180100624 – The role of epigenetic modifications in tiger snake adaptation. DP140103650 – Tracking the development of agricultural lifestyles in island Southeast Asia through modern and prehistoric rodent communities. Australian Centre for Ancient DNA, University of Adelaide, Adelaide, South Australia. DP13010455 – Reconstructing the impact of climate change on Australian native species. Dr. Scott Keogh, Australian National University, Canberra, ACT. Dr. Chris Burridge, University of Tasmania, Hobart, Tasmania. Wedge-tailed Eagle phylogeography project – optimization of microsatellite amplification for low template DNA samples. Dr. Steve Donnellan, South Australian Museum, Adelaide, South Australia. Rattus rattus species complex – phylogenomics to refine species boundaries. Dr. Fred Gurgel, State Herbarium, Department of Environment, Water and Natural Resources, South Australia. Phycology project – optimization of PCR conditions for inhibited and contaminated algae and sponge samples. 2008-2012 Doctor of Philosophy (PhD), Australian Centre for Ancient DNA, School of Earth and Environmental Sciences, University of Adelaide, Adelaide, South Australia. Supervised by Professor Alan Cooper, Professor Steve Donnellan, and Dr. Ken Aplin. 2006-2007 BSc (Honours) Degree, School of Biological Sciences, University of Queensland, Brisbane, Australia. Supervised by Associate Professor Anne Goldizen and Dr. Jennifer Seddon. 2002-2005 Bachelor of Science, majoring in Biochemistry, School of Biological Sciences; Bachelor of Arts, majoring in Archaeology, School of Social Science, University of Queensland, Brisbane, Australia. (GPA: 6.28). 1992-1996 Gisborne Girls High School, Gisborne, New Zealand. 2016 ‘History Hunters’ presentation about scientific classification and its use in conservation to students from Elizabeth North Primary School (25 May 2015). 2015 Adelaide Channel 7 news interview on Kangaroo Island emus, aired on 10th October 2015. 2015 ‘History Hunters’ presentation about scientific classification and its use in conservation to Year 7 students from John Hartley School (28 May 2015). 2015 Off The Fence Productions interview on mice plagues (recorded on 13 March 2015, TBA when broadcast). 2015 Presentation to Birds SA (27 February 2015): ‘The birds of Australasia’. 2014 E-science magazine article (University of Adelaide e-newsletter 28 July 2014): Ancient chickens key to reconstructing early Polynesian migrations. 2014 Presentation to Royal Society of South Australia (12 June 2014): Using ancient DNA to study the origins and dispersal of ancestral Polynesian chickens across the Pacific. 2014 Interview on Radio Adelaide (23 March 2014): Using ancient DNA to study the origins and dispersal of ancestral Polynesian chickens across the Pacific. 2014 Interview on Radio New Zealand (18 March 2014): Using ancient DNA to study the origins and dispersal of ancestral Polynesian chickens across the Pacific. 2014 The Conversation article (online newsletter, 18 March 2014): Chickens tell tale of human migration across Pacific. 2010 The Genographic Project: Tracing Your Family Roots with the University of Adelaide. 2015 Approximate Bayesian Computation (ABC) workshop, Adelaide, Australia. Featuring Alexander Xue from Mike Hickerson’s lab at City College of New York. 2015 SNPseq workshop, Adelaide, Australia. 2016 Guest Lecturer for ENV BIOL 3550:Evolution of the Australian Biota III, University of Adelaide, Australia – Phylogenetics on the command line. 2016 Tutor for ENV BIOL 3550:Evolution of the Australian Biota III, University of Adelaide, Australia – Using Geneious. 2015 Guest lecturer in epigenetics for ENV BIOL 3123: Issues in Evolutionary Biology, University of Adelaide, Australia – Epigenetics (and its implications in phenotypic plasticity). 2014 Supervisor of Research Project for ENV BIOL 3123: Issues in Evolutionary Biology, University of Adelaide, Australia – Using BayeSSC and ABC to reconstruct human demography. 2013-5 Co-Supervisor of PhD student (Michael Herrera). 2014- Treasurer of the School of Biological Sciences Post-Doc Association. 2014- Social Media officer of the Biological Society of South Australia. 2014- Founding member of the ‘Stats Solution’ network. 2015 SNPseq workshop, Adelaide, Australia – Developing GBS for a range of Australian terrestrial vertebrates: the problems and pitfalls. 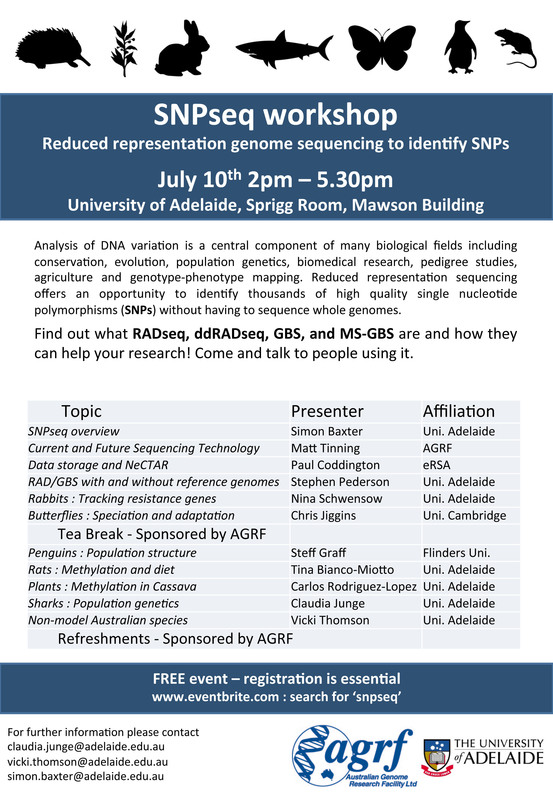 2015 Poster presentation at Genetics Society of AustralAsia (GSA) conference in Adelaide, Australia – Using genetics to understand the impacts of climate change on Australian endemics. 2014 International Council on Archaeozoology (ICAZ) conference in San Rafael, Argentina – Using ancient DNA to study the origins and dispersal of ancestral Polynesian chickens across the Pacific. 2014 Indo-Pacific Prehistory Association (IPPA) conference in Siem Reap, Cambodia – (Why) Did the chicken cross the Pacific? 2013 CAVEPS, Adelaide, Australia – Birds of a feather: island dwarfs flock together with mainland Emus. 2012 Australian Mammal Society, Port Augusta, Australia – A ghost of a chance? Evolutionary history of the Ghost Bat (Macroderma gigas) and its chances of surviving future climate change. 2010 Australian Mammal Society, Sydney, Australia – Climate change may invigorate endangered Hastings River Mouse (Pseudomys oralis): Ancient DAN informs conservation decisions. 2015 Environment Institute grant (AU$10,670) – Tiger snake venom: evolution in response to prey type. 2014 Asia Pacific Science Foundation Grant (AU$43,672 over 3 years) – New Guinean Long-beaked Echindas in the Kimberley, Western Australia – using ancient DNA analysis of skins and scats to confirm their presence and corroborate an outstanding biodiversity discovery. 2013 Sir Mark Mitchell Research Foundation Grant (AU$6,200) – The status of the New Guinean Long-beaked Echidnas in Australia’s north-west – survey by DNA analysis of scats. 2009 Field Naturalists Society of South Australia – Lirabenda Endowment Fund Research Grant (AU$4,000) – Diet analysis and phylogeographic structure of the locally extinct Ghost Bat (Macroderma gigas) of southern Australia. 2009 Nature Conservation Society of South Australia – NCSSA Conservation Biology Grant (AU$400) – Diet analysis and phylogeographic structure of the locally extinct Ghost Bat (Macroderma gigas) of southern Australia. 2009 Palaeontological surveying and excavations of Ghost Bat cave deposits, Flinders Ranges, South Australia. 2009 Palaeontological surveying and excavations of Ghost Bat cave deposits, Northern Agricultural Regions, Western Australia. 2006 Biological surveying of Eastern Grey Kangaroos, Lake Cootharabra, Queensland. The Emu (Family: Dromaiidae) is one of Australia’s most iconic species. Until recently the abundant nature of the mainland species was thought to reflect a high level of genetic diversity. However, recent work by our lab has highlighted a distinct lack of mitochondrial control region diversity in both island and mainland forms of the Emu, with this loss of genetic diversity thought to stem from extreme demographic events prior to the last glacial maximum. This honours project will allow the student to gain valuable lab experience by generating whole mitochondrial genomes (WMG) of exemplar specimens, plus essential analysis techniques as the student will examine WMG diversity levels with a view to evaluate the potential for expansion of the project into a PhD project in later years. Potential applicants should have a background in molecular biology/ecology, population genetics, or evolutionary biology, and have strong self-motivation, time management, and writing skills. Please direct your expression of interest including your CV to Dr. Vicki Thomson and Dr. Jeremy Austin. The echidna (Family: Tachyglossidae) is one of Australia’s most iconic species. Until recently only one species, the short-nosed echidna (Tachyglossus aculeatus), was known in Australia although three longer nosed species are found in Papua New Guinea. The renowned mammalogist Kris Helgen from the Smithsonian, has recently described a long-nosed echidna (Zaglossus bruijnii) skeleton from the Kimberley region of northern Australia that was collected in 1901. This honours project will examine echidna scats from northern Australia to explore the likelihood that a cryptic population of long-nosed echidna has survived in the Kimberley region. The project will be lab-based, with the student developing molecular species identification methods for the scats, and if a long nosed echidna population is found the student will investigate the population genetics of this species in Australia. Please direct your expression of interest including your CV to Dr. Vicki Thomson and Dr. Jeremy Austin.